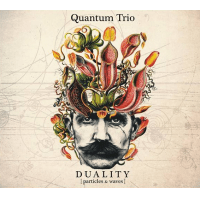 Quantum trio has magically created a sound that takes the best qualities from: classical music, jazz, avant-garde, and the singable melodies of pop, to form their own unique style. The three musicians are: Michal Jan Ciesielski on saxophone, Kamil Zawislak on piano and Luis Mora Matus on drums. The blending of supportive piano and hypnotic drum rhythms, with impassioned saxophone, glue the ensemble’s diverse sound, binding the two-disc offering entitled Duality. “Particles” kicks off the journey of the quantum notion. Under a moody two chord piano vamp, Matus creates a powerful rhythmic force in which Ciesielsk’s saxophone traverses upon. Always a trio of surprises, they suddenly they take off, overlapping on a hip groove. The three are able to create music that is solid, yet diversely complex and loose feeling at the same time. It is in their subtly of interplay that this trio excels, always listening to each other and making, well pardon the pun, music! The trio is able to create an impressive amount of variety, both in style and in sound. “Eigenstates” offers dual horn parts creating a harmonic flux, while the slow-loping “Branes” offers a repeating line shifting one note in each interation, building upon the motif. A monstrous “Here, There, Everywhere?” closes the Particles session, with gentle vocalizing; though the most “in” portion of the proceedings, it still conveys a reinforcement of the overall messaging. The Waves (disc 2 of Duality) disc beings with electric piano, almost to imply this section will have a more electrified feeling verses the all-acoustic vibe of Particles. Not that it’s a totally different feel or not a unified sound, it’s more of an affected soundscape approach. On this round, Luis Mora Matus steps more into the lead, his drumming is more frantic and steps up the energy to a higher notch. Sporting the most significant straight-ahead sound of the set, it’s a nice entree into “Light Years” to the elaborate “Photons” that explodes into the quantum of the electromagnetic field. Duality though it implies a course of difference, remains firmly connected and highly alluring, with just the right pinch of cerebral. A prodigious effort of scientific proportions, distilled down into an enjoyable listen. One part, acoustic, one part chaotic bliss, offering the listener of rapture of electromagnetic forces and sound.